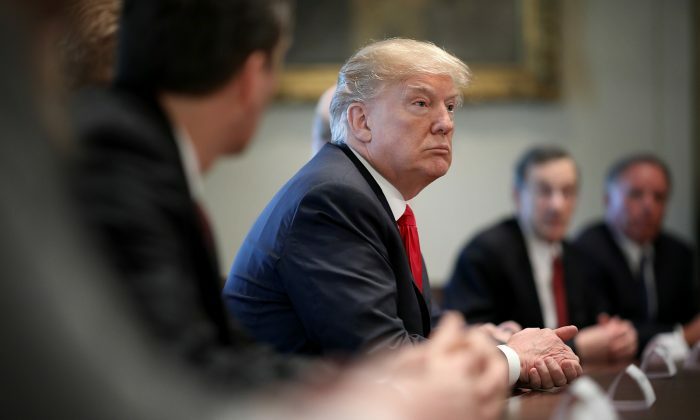 President Donald Trump signed orders on Thursday imposing a 25 percent tariff on imported steel and a 10 percent tariff on imported aluminum. Both tariffs are global with the exception of Mexico and Canada. “Due to the unique nature of our relationship with Canada and Mexico—we’re negotiating, right now, NAFTA—we’re going to hold off the tariff on those two countries, to see whether or not we’re able to make the deal on NAFTA,” said Trump during the signing ceremony of proclamations on March 8. The order contains a clause that recognizes the security relationship with a host of countries. These nations can opt to discuss with the United States alternative ways to address the threat to the national security caused by imports from that country, a senior White House administration official explained. As a result, there may be a flexible set of tariffs depending on the outcome of the discussions, he added. Trump met with steel and aluminum workers at the White House for the signing ceremony of the proclamations. “The actions we are taking today are not a matter of choice. They are a matter of necessity for our security,” Trump said. The process began in April last year when Trump ordered an investigation into whether imports posed a threat to national security. The U.S. Department of Commerce carried out an investigation under Section 232 of the Trade Expansion Act of 1962. In February, Secretary Wilbur Ross concluded that steel and aluminum imports “threaten to impair the national security” and recommended immediate action. Trump’s decision on tariffs dates back to his campaign promise made in Pittsburgh, Pennsylvania, on June 28, 2016. Steel and aluminum are a critical part of the nation’s defense industrial base. They are also critical commodities for infrastructure such as the electricity grid, dams, and transportation projects, according to the White House official. In addition, over 90 percent of aluminum demand is imported, according to the Commerce Department report. Since 2000, U.S. steel and aluminum industries lost over 50,000 and 40,000 jobs, respectively. The official also criticized the news on the economic impact of tariffs. He called them “fake news” and said the judgments from lobbyists and politicians are baseless. For example, for a six-pack of soda or beer the incremental cost will be a cent and a half to two cents, he explained. And for a $330 million Boeing 777, the additional cost is only $25,000, he said. “Since there are no significant downstream price effects, there will be no significant downstream job effects,” he said.